197 pages | 12 B/W Illus. The ship transcends the descriptive categories of place, vehicle and artefact; it is a cosmos, which requires its own cosmology. This is the subject matter of this volume, which falls within the broader, flourishing sub-field of maritime anthropology. Specifically, the volume first investigates the dialectic between the sea, the ship and the ship-dweller and shows how traits are exchanged between the three. 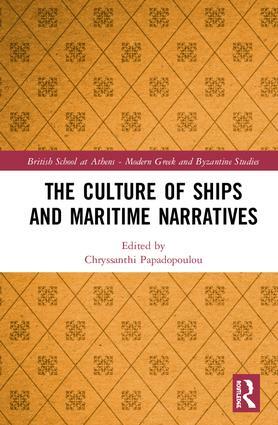 It then focuses on land-dwellers, their understanding of seaborne existence and their invaluable contribution to the culture of ships. It　shows that the romanticised views of life at sea that land-dwellers hold constitute an important aspect of the cosmology of ships and they too need to be considered if the polyvalence of ships is to be fully understood. In order for this cosmology to be written, some of the volume’s contributors have travelled on ships and interviewed mariners, fishermen, boat-builders and boat-dwellers; others have traced the courses of ships in poems, films, philosophical texts, and collective myths of genealogy and heritage. Overall the volume shows where ships can go, and how they are perceived and experienced by those living and travelling in them, watching and waiting for them, dreaming and writing about them, and, finally, what literal and metaphorical crews man them. Chryssanthi Papadopoulou is a maritime archaeologist, a Classicist and the Assistant Director of the British School at Athens. She has published on the perception of shipwrecks by maritime archaeologists; underwater sites of various periods; Greek religion; and the archaeology of Classical Athens, and has been excavating shipwrecks in the eastern Mediterranean since 2005. Her research draws on various disciplines including land and maritime archaeology, philosophy, anthropology and analytical psychology. The study of modern Greek and Byzantine history, language and culture has formed an integral part of the work of the British School at Athens since its foundation. This series continues that pioneering tradition. It aims to explore a wide range of topics within a rich field of enquiry which continues to attract readers, writers, and researchers, whether their interest is primarily in contemporary Europe or in one or other of the many dimensions of the long Greek post-classical past.